I've been trying to get my dad to watch the original GitS, it hasn't worked. He's one of the "it's anime so I'll never watch it" crowd and yet he really likes cyberpunk movies... .
how would final fantasy(the ghost-like movie, not the squenix stuff) place be in all this? i remember my father didn't dislike it, iirc we even watched it in a cinema. at least i know my mother does like some animes... she'd probably like spice and wolf too as she loves natsume yuujinchou. Well the images, memes and references I stumbled upon at the time S&W was new featured, with very few exceptions, pictures of Holo without clothes. True, she's naked for the majority of her screentime in the first episode (wouldn't make sense otherwise anyway), a short bit in the second, somewhere towards the end of the first arc for a few seconds and then again for, what, three seconds in one of the last episodes of S1, BUT NO ONE EVER REALLY CARES! No blushing, no nosebleeds, no "ooooh sexyyyyyyyyy" hints. In S2 I think it was even less, so yeah the show was grossly misrepresented . @Final Fantasy: Spirits Within: I don't think people perceive it as anime. I mean, it's only very slightly more CGI than James Cameron's Avatar was. I think GitS is a great introduction to anime if the person likes SciFi, a bit of philosophy and action. It's also a real shame that my parents so far couldn't be bothered to watch a Ghibli movie. I think they'd be impressed. well, my father is the kind of guy that likes terminator, the expandables, steven siegal's movies,etc... so i don't want to bet high on the fact that he may watch animes. as for ghibli, in my family only my brother nobody watched ghibli stuff except for the errant castle of howl, which my mother,i and my brother loves, my father not that much, but he can watch it if needed. considering how i marathoned the whole first series in just one day, i hope the same can happen with this one. It'll be either really good, or really bad. mdw ppl don't understand "fighting spirit" and write off the entire final battle as pointless. slaine's ambitions for empire were never achieved. it had so much potential. Oh god, that Aldnoah.Zero ending. Best comedy 2014. Wait, what was that, it was supposed to be serious? I GUESS THE SPACE WIND DROWNED YOU OUT. 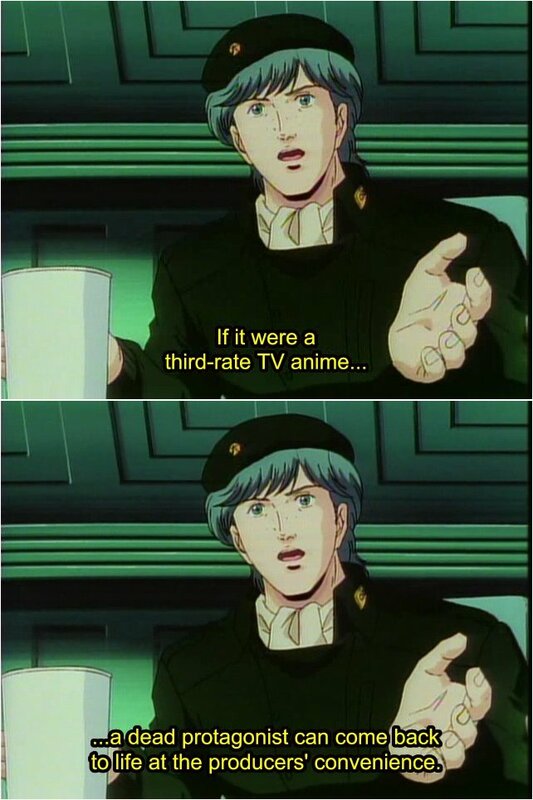 God, that anime was garbage. It was so bad I kept up with it just to laugh at how bad it was. "brb hacking your mech by touching it." I mean, seriously? I had no objection to the last fight scene. I was kind of expecting another ending like season 1 so they could make 14 more seasons and keep raising the dead.